I actually took a couple of plain buckets from Dad's shed. There were a good size (say about 5 gallons - 18-20 litres). The issue was - no holes for drainage. Warning - There may be some damage. No not the bucket - ME!! In retrospect, I probably should have drilled larger holes. But we'll see how it develops over the growing season. 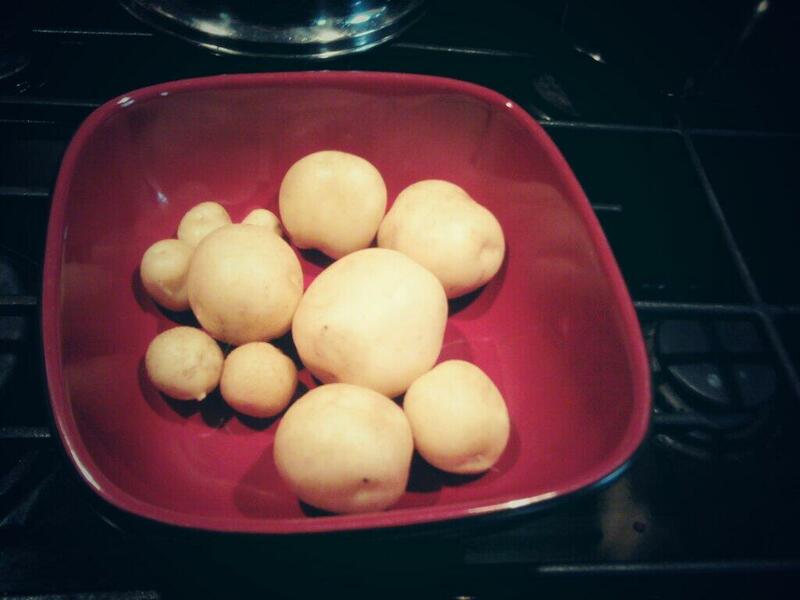 Cut seed potatoes into chunks having at least 2 eyes each. Each piece should be about 1.5-2 inches long. Allow the pieces to dry, about 2 days. Whole seed potatoes can be planted if they are small. Have your bucket? If not, get it out! I know it's not the one from above... Let's pretend it's yellow? No need to use good quality soil. I used some black earth with a bit of peat and compost. 3:1:1 ratio maybe - I was not exact. Fill container to about 1/4 full. Top the potatoes (just) with some more soil. Look closely and there is a slight peek out of the potato. That's how thin I top the soil. Water the soil thoroughly. It should be moist but not soggy. 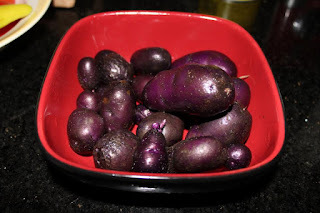 Now - I ask that you come back periodically as I will update this post with pictures of the potato crop progress - Promise? When you start to see leaves and sprouts come, mound some soil around it. Don't cover the leaves as they need to be exposed to the sun and air. As the potatoes continue growing, keep adding soil mix until you reach the top of the container. Keep watching in September/October (depending on maturity date of potato and when you planted), the potato leaves and stems will begin to turn yellow. Timing will vary somewhat depending on the potato variety. Typical grow length is 75-90-100 days. When the leaves and stems have died back and the weather is cooler, stop all watering. The leaves and stems will turn almost completely yellow within a week or two. You are ready to harvest. Some of last years harvest - About one bucket full. 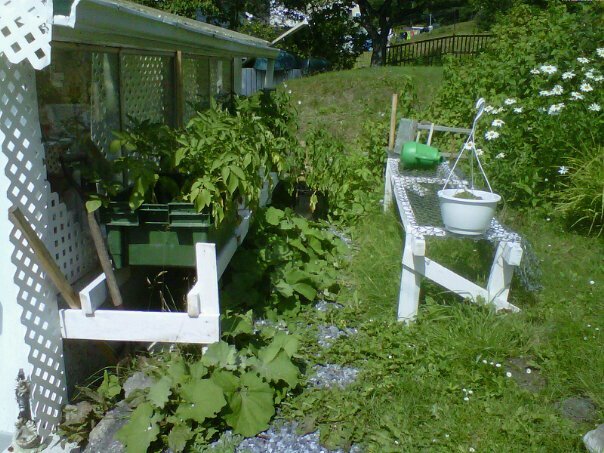 Post Script - Here is a picture of my Dad's last potato garden - He was very proud of it. To learn a little about why my Dad is the biggest influence in my gardening life - here's a snippet.